Banker by day and denizen of Los Angeles’ clubs by night, the protagonist of Ghalib Shiraz Dhalla’s groundbreaking, critically-acclaimed novel has left behind a tempestuous childhood in postcolonial Kenya, the mother who raised him on a steady diet of Bollywood cinema, an emotionally abusive bisexual lover, and inescapable memories of his father’s violent death at the hands of a mistress. Passionate and unflinchingly honest, Ode to Lata scavenges the depths of one man’s misguided and relentless search for love in a world of emotionally void encounters and tangled memories. All the while Ali’s story is intertwined with the unraveling of his parents’ own doomed relationship and the film music of Bollywood’s eminent singer, Lata Mangeshkar. 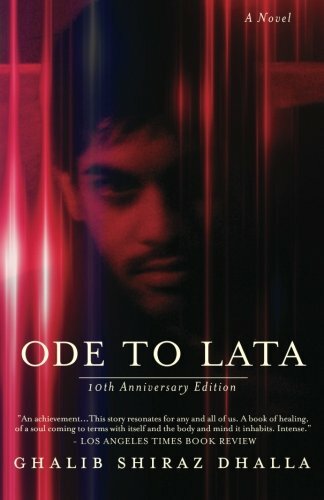 This edition also features the bonus short story, A.
Ode to Lata was turned into the major motion picture, The Ode starring Sakina Jaffrey, Wilson Cruz, Rebecca Hazlewood, Anil Kumar Bhardwaj, Sachin Bhatt. — Mark Jude Poirier, author of Goats. — Sunaina Maira, author of Desis in the House: Indian American Youth Culture in New York City and coeditor of Contours of the Heart: South Asians Map North America.